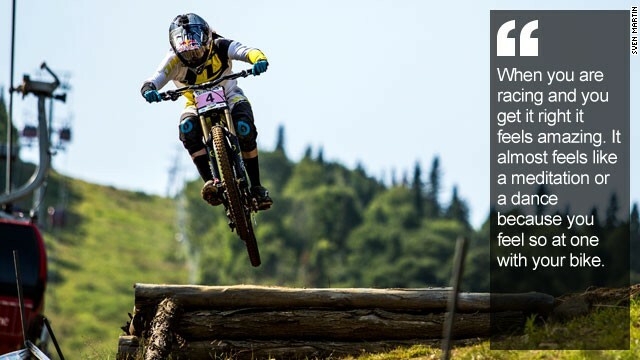 (CNN) -- Rachel Atherton is haring down a narrow muddy path on a hillside riding every hump and bump with the skill you would expect from a double world champion. She may be surrounded by beautiful, rolling countryside on all sides in north Wales, but the trail she is tackling today in Llangollen is known as a bit of a beast in mountain biking circles. The course is frighteningly steep in places, frequently rocky and steeped in mud, but the 27-year-old negotiates every perilous twist and turn with ease. 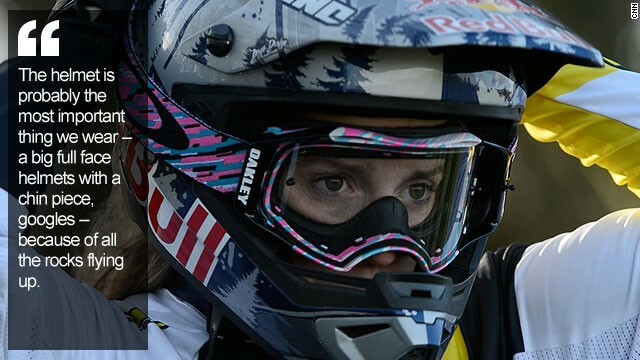 "When you are racing and you get it right, it feels amazing," Atherton told CNN's Human to Hero series. "It almost feels like a meditation or a dance because you feel at one with your bike, putting it exactly where it needs to be and the rocks and bumps are working in your favor and it feels perfect." 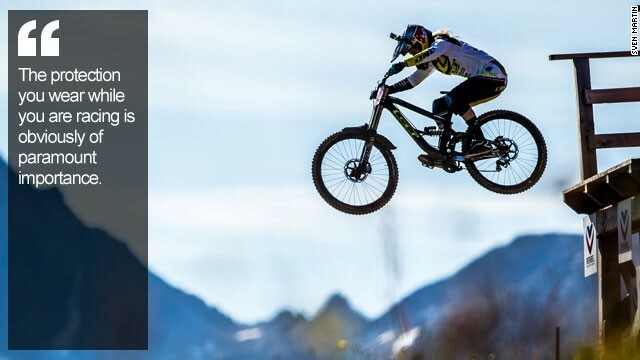 Atherton has been risking life and limb bombing down mountain sides for more than a decade competing in the discipline of downhill mountain biking. 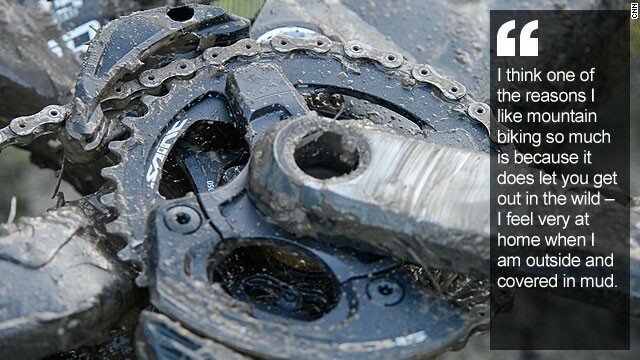 "The average mountain bike race lasts five to six minutes, which doesn't sound long, but when you are hurtling down a mountain at 40-50 mph (65-80 kph) and you've got obstacles -- rocks, roots, big jumps, trees to dodge ... it's pretty hard work!" she explains. "You physically need to be strong and very fit but also you need to be able to mentally overcome challenges -- if you're scared or a bit nervous -- and be able to put yourself in to the zone where you are willing to take the risks. You need to believe in yourself." 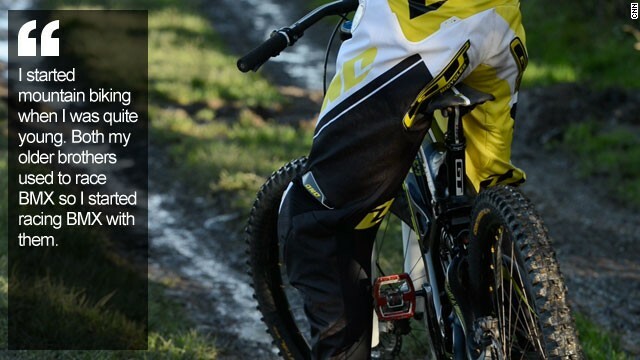 Atherton took up BMX racing at the age of eight before switching to mountain bikes three years later. She admits to hating it at first, preferring to play netball and hockey at school, but encouraged by her two brothers she quickly became hooked on the sport. 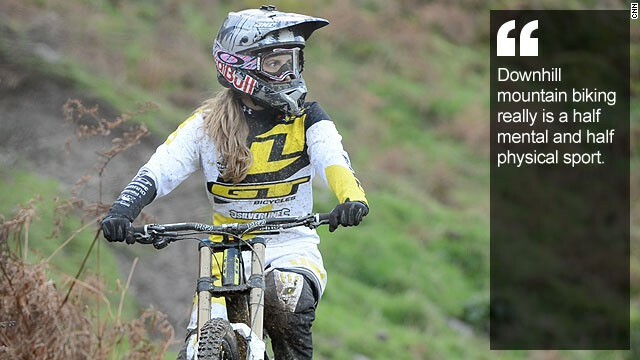 In 2004, aged 16, Atherton clinched the UK senior downhill title and four years later won her first World Championship. 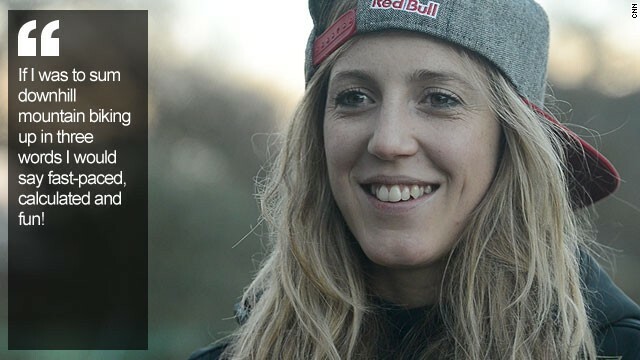 She has since gone on to amass 21 individual World Cup downhill wins and been crowned overall World Cup champion three times. "Having two older brothers was amazing. 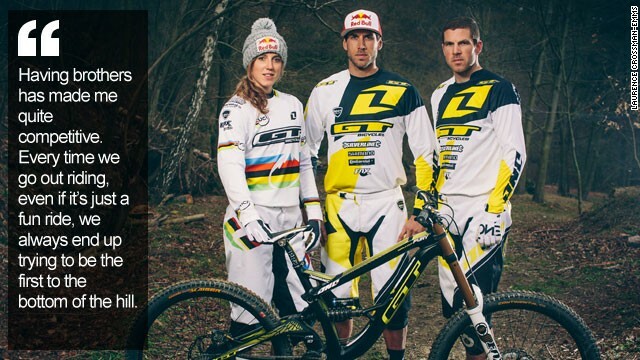 I've no doubt that I wouldn't be where I am today without having my brothers as role models," she says of reigning downhill world champion Gee (29) and 32-year-old Dan, who has tasted success in four-cross (4X) races -- think ski-cross on two wheels. "(It's) made me quite competitive. Every time we go out riding, even if it's just a fun ride we always end up trying to be the first to the bottom of the hill ... so it's a really good environment to be an athlete. You are always striving to be the best," she says. 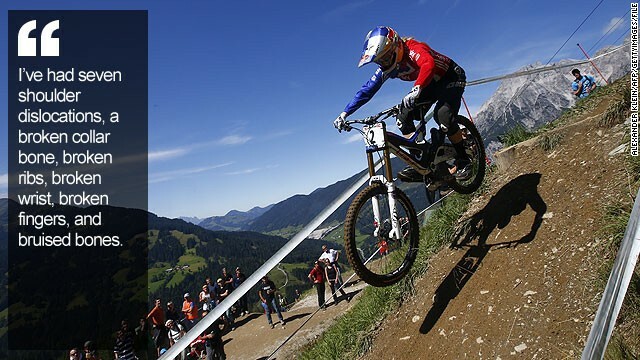 The friendly sibling rivalry has bred numerous individual wins, sometimes at the same World Cup events. 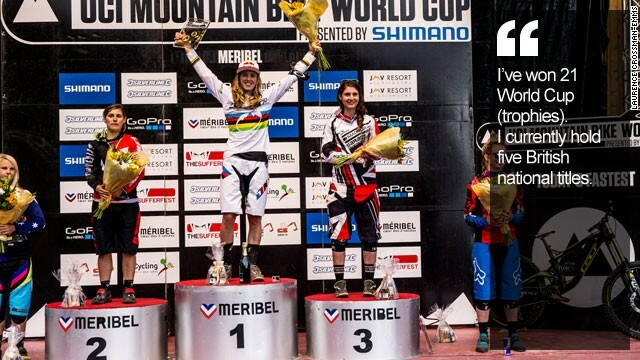 Atherton and Gee have "done the double" a couple of times winning both men's and women's downhill races, but nothing will top one glorious day when all three of them stood on top of the podium. 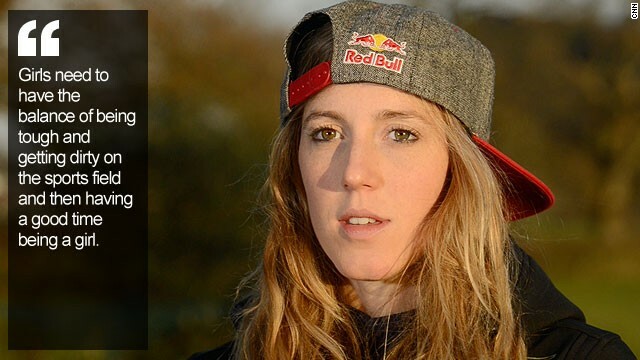 "The highlight of my racing career so far has got to be the 2008 World Cup in Andorra when Dan won his four-cross, Gee won the men's downhill and I won the women's downhill. For all three of us siblings to win the World Cup in the same day was a tearful day!" As might be expected in such a dangerous sport, tears have been shed following more painful experiences. 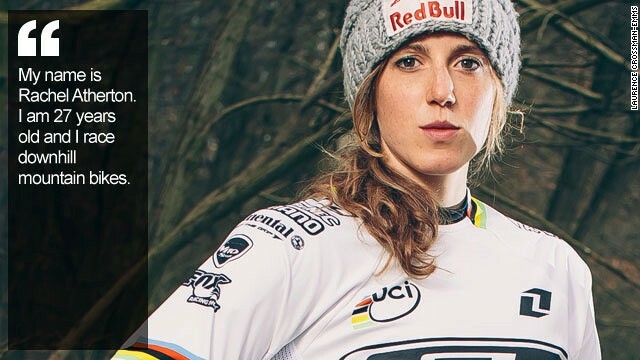 Atherton has perhaps suffered more than most riders during her career, breaking ribs, wrists, fingers and a collarbone, as well as dislocating her shoulder seven times. The worst unhinging came not up a mountain, but on a road when she was hit by a pick-up truck in California during a winter training camp in January 2009. "There was a lot of nerve damage and I had about three or four operations over the following year to try and get me back on track. I had to have a nerve graft which was pretty big surgery really." 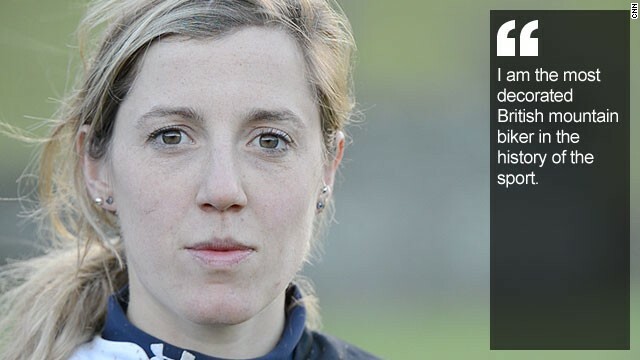 Inevitably, the setback led to a certain amount of soul-searching about whether she wanted to carry on racing, but she eventually returned replenished both physically and mentally. "Being injured or having time off definitely gives you something that you didn't have before. It gives you a real hunger and a real determination to prove to yourself that you can get back up and be as strong as you once were," she says. 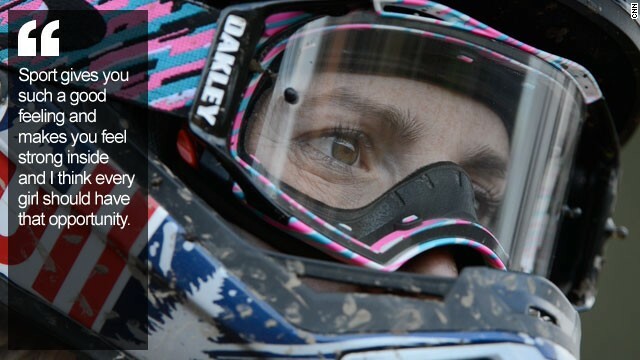 It's an attitude that hasn't done her any harm so far with Atherton enjoying her most successful period in the sport in recent seasons, completing the World Championship and World Cup double in 2013. 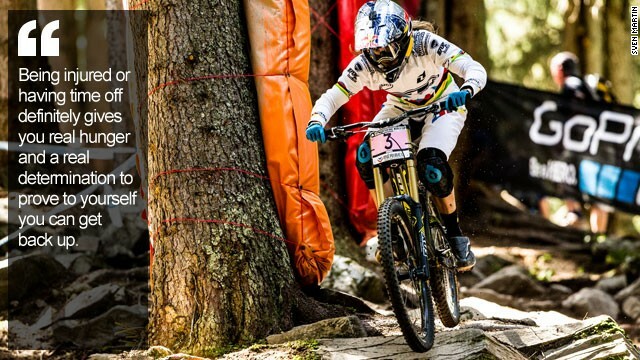 Atherton narrowly missed out on a fourth World Cup crown this year -- she finished second to compatriot Manon Carpenter -- but she's setting her sights predictably high for 2015 targeting another World Cup and World Championship double. Another championship-winning year would also help in her continuing quest to encourage a new generation of girl racers. "Girls need to have the balance of being tough and getting dirty on the sports fields and then having a good time being a girl," she said. "I think what I've always tried to do in my role as being a top athlete is to show girls the confidence that sport can give you. It gives you such a good feeling and makes you feel strong inside. I think every girl should have that opportunity."